Tokyo, September 3, 2013 – Fuji Heavy Industries Ltd. (FHI), the maker of Subaru automobiles, today announced that Subaru of China Ltd. (SOC), its sales subsidiary in China, has completed procedures to become a joint venture with China's leading auto dealer group, Pangda Automobile Trade Co., Ltd. (Pangda). 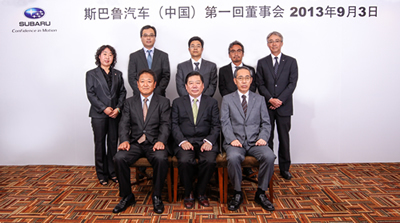 SOC in its new form held the first board meeting today attended by representatives from FHI and Pangda, and the company will begin full-scale operations in October as Subaru's sole distributor in China to manage and oversee Subaru car sales throughout the country. The purpose of this structure change is to consolidate Subaru's sales, marketing and dealer management operations into SOC as the brand's sole distributor in China, whereas those activities used to be managed on a region-by-region basis by local sales companies. Under the new structure, SOC intends to implement more unified, consistent sales and marketing initiatives, advance strategic dealer development and strengthen its profit base with the goal to enhance the Subaru brand and sales in the Chinese market, one of the top priority markets for Subaru along with the U.S. and Japan. Under the new organization, Pang Qing Hua (Chairman, Pangda) and Masami Iida (Vice President, FHI) have become Chairman and President, respectively. The capital of the new SOC has been raised from 600 million yen to 2.95 billion yen, with FHI holding a 60% stake and Pangda 40%. The workforce will be also reinforced with the planned increase from the current 80 to a 200-employee level. In its partnership with Pangda which has wealth of experience, expertise and strong network in the Chinese market, FHI will pursue further growth through Subaru brand enhancement with high quality sales and service activities. Company Name SUBARU OF CHINA LTD.
Company Name PANGDA AUTOMOBILE TRADE CO., LTD.